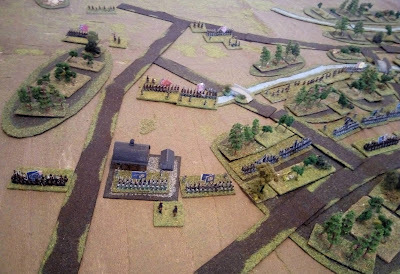 Please see link for my refight of the Battle of Freeman's Farm, but re-set from the AWI into the War of 1812, using the Polemos Ruse de Guerre rules. I don't care for the rules either, but you did a fine job with the game. Many thanks all. Hopefully there will be a couple more of these battles in the near-ish future. I'm really glad to see that your using the sliding scale. It was a very important feature for the rules as a number of the battles in North America are small. So being able to blow them up in scale and size lets more players enjoy the action at the same time. All of the scenarios in the rule book are blown up to show this feature. Being able to reduce them in size and scale as you have done is intended to work for players like yourself who often play solo. It's also a great tool for beginners as they can quickly get to play these exciting battles with a minimum amount of figures. As their collection grows so can the size of their battles. I'm not aware of any other rule set that has this feature in such a simple format. whirlwind, do you think the smoothing could be easily employed for a second edition of the Polemos rules? Or could house rules be used to get the same effect? Why is Ruse de Guerre smoother? The sum of that is that there are far fewer 'fiddly' situations where bases end up interacting in complex ways. The Polemos rules are, I think it is fair to say, an evolution of the DBx system but don't spend the time Phil Barker does on regulating exactly how bases can interact (all that conforming stuff). For lots of situations that is fine and makes the Polemos rules easier than DBx; but where there are complex series of events, it is sometimes quite hard to work out how it should play out (and there are some obvious geometric cheats, if one should be so inclined). You have to go with the flow, a little. So Polemos RdG is, in my opinion, almost like a 3rd edition of the General de Division Napoleonic rules, refined by a lot of playing, with some theatre chrome added and naturally, the specific Napoleonic stuff (i.e. cavalry) removed. But these are independent of the troops on the table in many ways, so it doesn't add an equal amount of complication back in. and that would probably work ok. Thank you Whirlwind! I will look into combining sets as you suggest. I wonder if Baccus has any interest in updating their Napoleonic rules. Ruse de Guerre covers the wars in North America, French & Indian War, American War of Independence and the War of 1812. The War of 1812 is a Napoleonic War. During play testing it was compared to Napoleonic rules and American Civil War rules. In both cases the play testers all agreed that not only did they work well for the periods, they were also faster to play and easier to learn. Since then we adopted them as our "Club Rules" and use them for all our Horse & Musket games including the Seven Years War. All we do is let the scenario designer add any specific rules he feels are required for his game. So far none have been added that would be considered period specific. Knowing that wargamers love to tinker with rules they were designed to allow them to do so. Although I caution anyone from doing anything as they were extensively play tested to achieve a certain balance in all the charts including Tempo. Baccus already has a second addition of their Napoleonic rules. I'm not aware of any plans for a third addition. If I can assist you any further, just ask. We have not yet found the need to add any house rules. The rules have a "Troop Quality" rating. When we play a European Napoleonic game most heavy cavalry are rated as "Well Trained" which gives them the highest possible rating in the game (there are only three levels). The line cavalry is often rated as "Trained", one level below WT. The rules allow you as the scenario designer to rate your troops anyway you want. There is, however, a guideline for novices. We originally had an extensive massed artillery section. Extensive play testing confirmed it was not needed. The rules have an "Ad-Hoc Forces" section which lets the C-in-c use artillery anyway he wants. So if he wants to form a massed battery he can. The artillery stills fires as single units but when they are close together the overall effect is substantial. So no special charts, diagrams, fire effects, etc. Hope this explains it, if not just fire away. Glen, this is really interesting…having trouble understanding how this works. Going to have to play this out for both Napoleonic cavalry and artillery. Thanks to you and Whirlwind for the ideas! This sounds good! Yes, you have to play through a game or two before most of the pieces start to fall in place. Although it still takes time to become a master. We have been playing the finished version for two years now. A seasoned player said to me just last week that he can't believe that when he thinks he just played his best game ever the next one is always more challenging and more fun. So as soon as your ready for another question or two let me know. I'm often on TMP and the Baccus Forum. Funny how we wargamers like to tinker. Some of what you have done is in RdG. Just done in a slightly different way. Such as rate OG as Well Trained and they get a +1 for firing. All troops on higher ground get a +1 for attacking or defending. Rate a General as Plodding and it's very hard for him to do anything without getting support from his commander. No commander can lead an attack unless his superior has authorized it. The overall balance in RdG was carefully crafted after a lot of playtesting. So use extreme caution with adding modifiers. Even a basic +1 can turn some troops into supermen.